Are you looking for an opportunity to get your style ideas and fashion articles published? The Apparel Search Company is continuously writing fashion editorial to strengthen the Apparel Search brand as well as to provide fresh fashion content to inform and educate our readers. The Apparel Search Company's continued goal has been to build a value-added website for the fashion industry. If you wish to assist by providing your writing services, please let us know. This may be an opportunity for you to get noticed, get published, and quickly expand your influence on fashion and style. Do you wish to share your fashion industry expertise, fashion trend observations, and opinions about style with the world? If the answer is yes, we may have the opportunity that you have been searching for. Apparel Search, one of the internets largest fashion industry guides, is often looking for freelance writers to produce articles and initiate blog postings on our clothing industry web sites. We currently maintain, fashion career sites, apparel business to business portals, fashion news sites, fashion blogs and more. As our in-house writers take on more projects and responsibilities, we occasionally seek assistance from freelance writers with proven experience writing about fashion. 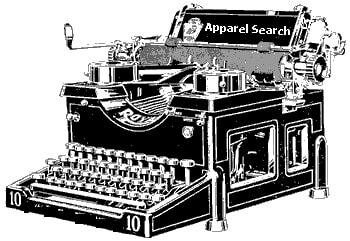 If you have interest in becoming a freelance writer for Apparel Search you can contact us to express your interest. Freelance contributors have the flexibility to work anytime, from anywhere. Easily submit and manage your articles. This is your opportunity to share your thoughts and experiences. Learn about fashion industry op-ed articles in our terms section. We currently have a unique opportunity at one of our news websites that may be of interest to you. At the Fashion Newspaper website, you will find a method for sharing advertising revenue by posting fashion articles or fashion blog postings. Visit the Fashion Newspaper site to learn more information. If you are a fashion journalist, please join in the discussion at the fashion journalist group on the Fashion Industry Network.